When my son turned two I sought the Lord about how to handle Halloween in our home. At that point he was toddling around with tiny steps and there was a huge part of me that really wanted to put him in some crazy cute get-up and show him off to all the neighbors! I had such fond memories of fall evenings running with friends from house to house on that night. Then, rushing home with excitement to revel in the bounty I’d collected. It was a good, pure memory for me and one I desired for my own kids. I really needed the Lords guidance though to help set a precedent with our kids for Halloween. I don’t believe there is any one “right” way for everyone, but what the Lord showed me has been a blessing and is still the way we approach Halloween six years later. The kids know that their costume choices have to follow the Philippians 4:8 rule (whatever is true, whatever is noble, whatever is right, whatever is pure, whatever is lovely, whatever is admirable—if anything is excellent or praiseworthy—think about such things.) and be “silly” in nature – nothing scary or “dark”. And, we are very, very careful to “guard our gates” (an awesome article about this here, http://sarahbessey.com/guard-gates/). In other words, we are very careful about what our little eyes see. We intentionally choose to get candy from homes where the “light is on” both literally and figuratively. 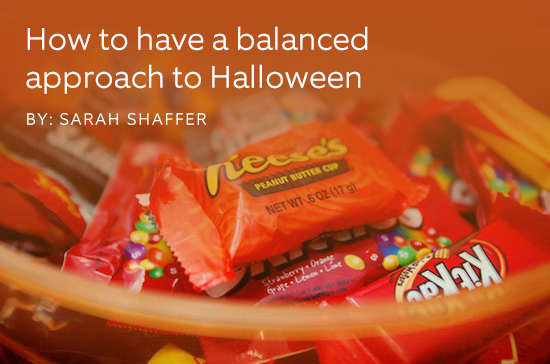 I had great peace about how we would handle Halloween, but in the early years of seeking more balance in my health, Halloween posed another source of stress and anxiety for me. The candy, oh the endless, endless candy! I simply did not want all that temptation, nor did I really feel that my kids should be eating that much candy for seemingly months on end. So, again, I sought the Lord and as always He was faithful with an answer that has blessed me ever since. I want to share it with you in hopes that it helps bring more peace and balance to you this year! The kids collect as much candy as they want to, after all the collection is half the fun. We all sit down together and sort, and ooh and ahh over the amount, then we ALL pick our three favorite pieces to enjoy right then and there. I participated in this right from the get-go. I want to model balance for my kids and let them see that it’s ok to enjoy something like small amounts of candy once in a while without it leading to disordered eating. Then, they are given the choice to trade in their candy or keep it. They can “trade” their candy for an experience (I did toys the first year, but quickly realized that wasn’t the best option). They hand over the remainder of the candy, and in trade I give them an IOU for a trip to the museum, or the zoo, or the movies, any healthy experience they choose. So you may be thinking, ok great Sarah, but what if they choose the candy!? I know! Admittedly, I still wait for their answers with bated breath hoping it’s never the candy. If they choose the candy, they get to keep as many additional pieces as they are in years (four pieces for my four year old, eight for my eight year old, etc.). Can I be honest though? They never have! I think there is almost a tiny, albeit, denied part of them that almost feels relieved to have that much abundance controlled for them – I think it’s overwhelming even for kids! As for the rest of the candy, I either offer it to my dry cleaner to hand out throughout the year, or friends, I simply toss it. It’s ok. I’ve let go of the guilt. I really think it’s ok to just let that one go – guilt be gone in Jesus name! I pray this blesses you and your family and may THE light of the world shine on you this fall season!